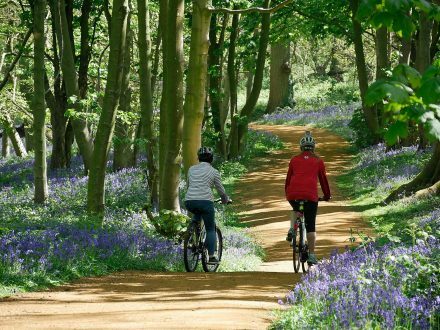 The National Trust has opened a new all-weather, multi-use trail at Blickling that will give families the opportunity to get active and discover the wider parkland and abundant wildlife that calls it home. Officially opening on Friday 9 June, the route at Blickling offers a new 4-mile safe off-road path through the beautiful historic park and farmland. The new trail follows existing paths for all but 800m, with a new stretch completing a circular loop that avoids roads. The all-weather surface also means more people can explore the estate whatever the season. Stuart Banks, Countryside Manager at Blickling, said: “With more families visiting Blickling, it’s important for us to provide a safe place for them to enjoy the wider estate. Cycling is an activity that the whole family can enjoy together and this provides an easy, safe route to get them started. The park is Grade II* listed, which meant that very careful consideration had to be given to the material used for the trail’s surface. The new trail has enabled Blickling’s countryside team to improve and repair many areas, which had previously been muddy or pot-holed from heavy use, making the park more accessible even in the wettest weather. There was also noticeably less damage during Blickling’s recent bluebell season, with visitors keeping to the well-marked path, protecting these native wildflowers.